To me creativity is the inner drive to make something out of “almost nothing”, the urge to improvise when you have the need for something and you seek out the materials to make it with your hands, to have that image in your mind that needs to become real, tangible, useful and possibly beautiful. As a result the object becomes a part of you. The casual relaxed lifestyle in St. James allows me the freedom to work at my pottery when an idea or the urge hits me. I’m able to walk into my studio and get right to it within a few moments or at least get a sketch on paper. The natural beauty of this community encourages one’s creative spirit. As I work in my studio (garage) with all doors wide open for the gentle breezes, the birds are singing, the anoles visit, the turtles sunbathe at the pond’s edge, and it just doesn’t get any better! The winter makes me keep the doors closed but fortunately NC winters are short. 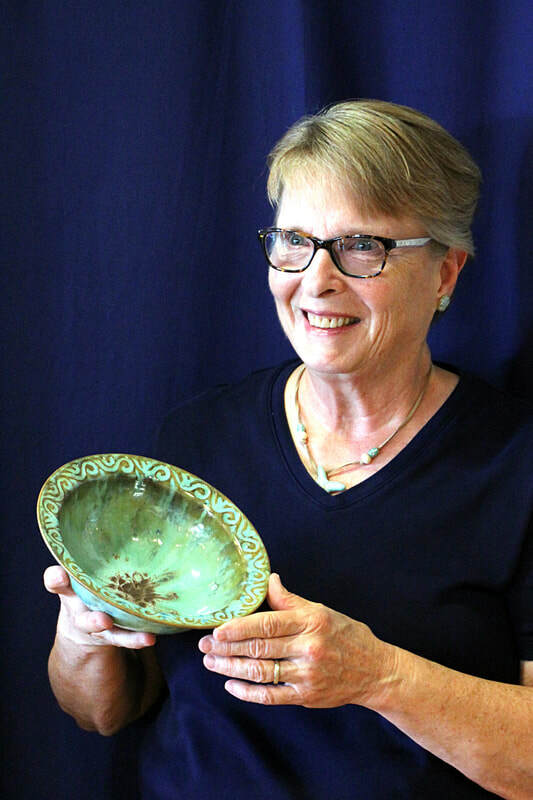 I enjoy participating in workshops, reading about other potters’ techniques, and watching pottery demonstrations online. I can always pick up a new tip or two to enhance my own work. I don’t have a dream project per se. I immerse myself in every project. If I’m not happy with the outcome, it doesn’t leave my studio. There are so many special spots in St. James that it’s difficult to single out my favorite. I’d have to say that I’m drawn to water, be it the ocean, waterway, marsh or pond. The rolling waves on the beach are the inspiration for the carvings on my bowls and mugs. The calmness of the pond water and the wildlife activity around it is as soothing as the clay medium itself. I feel truly blessed to live and indulge in my passion for pottery in St. James.